The most significant feature of the above graph has to be the length of time the actual revenues exceeded the forecast. Personally, I find it interesting that the magnitude of these errors did not precipitate a revision of the forecast. Obviously the consequences of actual above forecast are less severe than actual below forecast, unless you believe policy makers lose all ability to make judgements based on the revenue forecast. (I take a look at forecast accuracy measures in this post.) Honestly the graph looks like there is a structural break in the revenue generation from sales tax in mid-2011, which most would rightly trace to impacts of the oil expansion. Starting in mid-2013 forecast and actual are much closer to each other, though starting in mid-2014 there is a clear downward trend in the sales tax collection numbers. If we want to say the forecast follows suit it then takes a massive reversal in 2015. 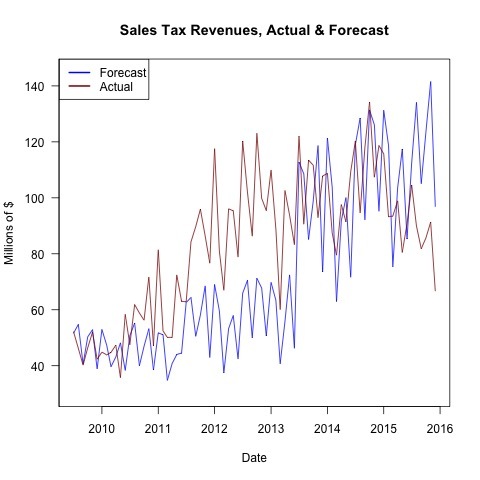 Why the prediction for a large increase in sales tax revenues? I have no idea. Maturing of the industry or not there would be no reason to expect sales tax revenues to continue that type of increase. The above graph generates the difference between the two series from the first graph. We see increased volatility starting in mid-2013 but it bounces around zero and then in 2014 it remains volatile but starts a clear downward trend into consistent misses with the forecast value above the actual. It is interesting that the volatility increased as the performed better (in the sense that it seemed centered around zero). The volatility of the series was less when there were huge “positive” misses. Different groups held the contracts for the forecasts at these times so there are likely different models underlying these series and therefore a difficulty to evaluate them. 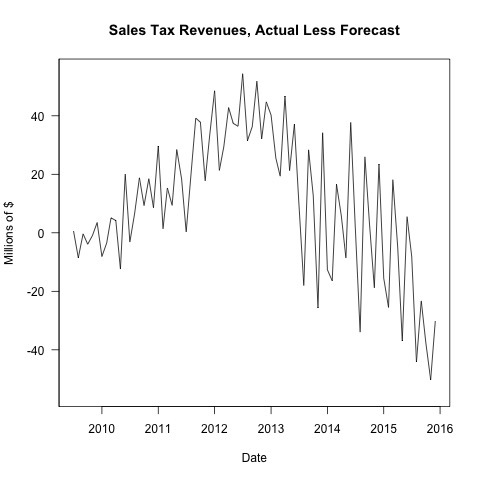 The basic outcome here is that the forecast models did not help us understand the evolution of the actual sales tax revenue. This in no way means the state could avoid the current budget situation and decisions, however it would likely mean a better understanding of the available revenue streams. That might allow better planning and decisions.